SubBrute is a community driven project with the goal of creating the fastest, and most accurate subdomain enumeration tool. Some of the magic behind SubBrute is that it uses open resolvers as a kind of proxy to circumvent DNS rate-limiting ( https://www.us-cert.gov/ncas/alerts/TA13-088A ). This design also provides a layer of anonymity, as SubBrute does not send traffic directly to the target's name servers. A lot of exciting updates... except for the readme file, which still needs to be updated. The big news in this version is that SubBrute is now a recursive DNS-spider, and also a library, more on this later. 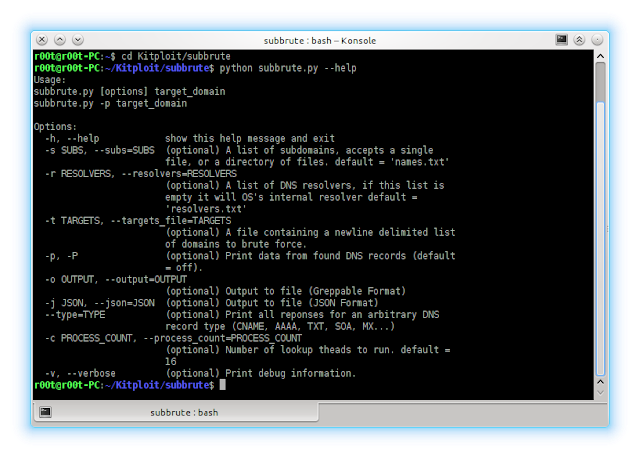 SubBrute should be easy to use, so the interface should be intuitive (like nmap! ), if you would like the interface to change, let us know. In this version we are opening up SubBrute's fast DNS resolution pipeline for any DNS record type. Additionally, SubBrute now has a feature to detect subdomains were their resolution is intentionally blocked, which sometimes happens when a subdomain is intended for for use on an internal network. This version merges pull requests from the community; changes from JordanMilne, KxCode and rc0r is in this release. In SubBrute 1.1 we fixed bugs, improved accuracy, and efficiency. As requested, this project is now GPLv3. A new filter that can pickup geolocation aware wildcards. More than 2,000 high quality nameservers were added to resolvers.txt, these servers will resolve multiple queries in under 1 sec. Nameservers are verified when they are needed. A seperate thread is responsible creating a feed of nameservers, and corresponding wildcard blacklist. -a will list all addresses associated with a subdomain. -v debug output, to help developers/hackers debug subbrute. -o output results to file. names.txt contains 31298 subdomains. subs_small.txt was stolen from fierce2 which contains 1896 subdomains. If you find more subdomains to add, open a bug report or pull request and I'll be happy to add them.